Are you an educator or parent interested in helping your kids learn more about the rainforest? If you can’t make it out here for a field trip, but still want to bring the knowledge and excitement of Moody Gardens to your students, you may be interested in our Outreach Program. The Outreach Program presents the Rainforest Roadshow! 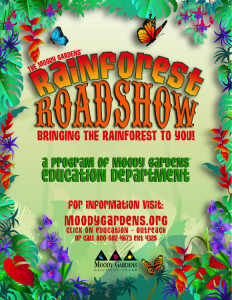 During the Rainforest Roadshow, a Moody Gardens rainforest expert will bring the wonder and beauty of the tropical rainforests to life for your students in the comfort of your classroom. The Rainforest Roadshow features multiple interdisciplinary presentations that incorporate rainforest artifacts, plants, and animals. Certain animals, when available, will actually accompany the rainforest expert during the presentation. Throughout the presentations, your students will learn valuable and interesting information about the Central and South American rainforest. Presentations are forty-five minutes long and available for up to eighty students at a time. Price is based on location. For presentations within Region IV, the first presentation is $100.00. You can schedule additional presentations for $75.00 and up to four presentations in a single day. Presentations outside of Region IV include a mileage fee. Reservations are required, and they must be made at least two weeks in advance. We recommend booking your Rainforest Roadshow as early as possibly so you can reserve the time slot you want. For more information and reservations, please call 1-800-582-4673, ext 4325 or email us at education@moodygardens.com. Moody Gardens is a public, non-profit and educational destination, which is why we are dedicated to teaching the youth about nature and conservation. To learn more about the educational events and activities we provide, visit us at http://www.moodygardens.com/teaching_learning/. Moody Gardens is also dedicated to providing our visitors with a fun and memorable time, so be sure to visit our Aquarium Pyramid and Rainforest Pyramid. The Moody Gardens Hotel is one of the best places to stay in Galveston and a popular vacation destination.